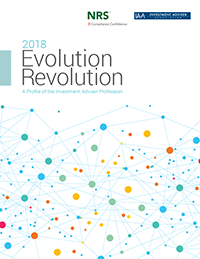 The Investment Adviser Association and National Regulatory Services conduct an annual report that profiles the investment adviser profession. The report is based on information filed by SEC-registered investment advisers electronically on Form ADV, Part 1. The reports contain data on the number of registered advisory firms (including newly registered hedge fund advisers), assets under management, employees, advisory and other business activities, types of advisory clients, compensation, custody, and financial industry affiliations.